Tea (Camellia Sinensis) is a plant originated in South-East Asia. All sorts of teas are coming from this one plant’s leaves. The diffrences come from the the way the tea was processed. Black teas are fermented for the longest time. Oolong teas for shorter time, then green teas for none. The type of tea is determined by the time of picking and which leaves they use from the plant. The process for oolong tea is rather the same only the time of fermentation is shorter. Green teas are not fermented at all. Apart from these there exist various herbal teas, fruit-teas and rooibos (lack of caffein) teas as well. Herbal teas are made of virtuous plants and can have many ways of preparation. Of course the teas mentioned above have healing powers however their basis is tea-plant and not some other herb. Fruit teas are the infusion of divers fruits. 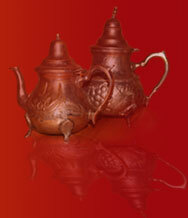 Rooitea or rooibos tea is popular, mild, spicy beverage from South-Africa. In Europe it becomes beloved and sought more and more. This plant lives only in Cape Province, South-Africa and just here can be found in its natural form, under Cadarberg Mountain Region climate. Processing goes same way as with black tea. Since rooitea contains no caffein and only a little of tannin therefor it has a soothing effect and it is recommended especially in cases of excitability, headache, sleep disorder, insomnia and depression.